There are gaming content suppliers which try to release products with multiple features, cutting edge designs and animations. But others work to keep their games simple, yet exciting. iSoftBet believe that there’s beauty in simplicity and they develop content with this idea in mind. If you look at their creations, you’ll see that they are indeed very simple and at the same time very attractive. iSoftBet is based in London and supplies its products to variety of legal markets. Their software isn’t the most popular, but can be found on websites of many reliable iSoftBet casinos. Considering that the company works since 2010, you can expect to see some old and quite disappointing titles. So, load their recent releases if you want more thrilling experience. As technology develops this supplier embraces new opportunities it offers. The way their games change with time shows that iSoftBet is constantly working on meeting demands of their customers and delivering them the best possible results. Their games are still simple, beautiful and intuitive to play, but animation and design became much more appealing. Any website in the list of iSoftBet casinos would offer you fair gaming. The developer isn’t licensed in just one or two countries. There are six European countries where this company is certified, including UK, Alderney, Italy, Spain. Each of these jurisdictions has strict rules and the developer complies with all of them. If you are playing their games, you’ll have six levels of protection which guarantee fairness. If you think certificates aren’t enough to prove games are fair, there are independent laboratories which have tested iSoftBet software and found nothing wrong. The company’s RNG (random number generator) was checked by iTech Labs, which is a world known, highly respected laboratory. Companies having so many certificates usually don’t provide biased games. So, if you lose or win playing at best iSoftBet casinos, that’s because of your bad or good luck. 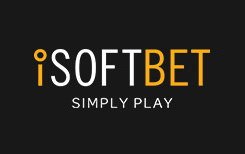 iSoftBet is mainly known as slot developer; however, they produce table games as well. There are a lot of different roulette types. Players with different bankrolls will find affordable roulette version. VIP version is for those who bet big and European Roulette Small Bets is for low roller gamblers. The developer has also developed several blackjack versions and few other table games. Visit one of reliable iSoftBet casinos to find a wide range of slot titles. For quite short period of time the company managed to release hundreds of games and many of them are playable on mobile devices. Their older creations don’t look great today, but there are a lot of titles released recently and players can load them to have fun. Usually slots offer free games with some additional winning features – generally wild reels. There are quite unconventional solutions the company offers. For example, Lucky3 slot machine. With 5×5 reel set, it has just 3 symbols: cherries, watermelon and lemon. Each row is a separate payline and each payline has its own multiplier from x1 to x5. When three or more similar fruits land on the same line, the winning is multiplied. Maximum punters can win is 500 credits. When playing this video slot, you can see that there’s indeed beauty in simplicity. The slot is very simple, but at the same time is so engaging and beautiful. Check the list of iSoftBet casinos to find variety of branded titles supplied by the developer. You can even find your favorite movie as there are so many video slots based on popular Hollywood movies: Basic Instinct, 24, Paranormal Activity and many more. Pay attention to other titles as the company has rich variety of themes. It’s also possible to hit a progressive jackpot when playing iSoftBet creations. One of progressive slots is Jackpot Rango, which is based on animated movie. The main character is a chameleon and it is surrounded by other weird creatures. To get growing prize pool, you need to make maximum bets and have five Jackpot symbols on active payline. It will earn you around several thousand Euros.